Though she may not be a common household name just yet, WINIFRED PHILLIPS is no stranger to critical acclaim. And this year, she’s finally walking away from the Hollywood Music in Media Awards with a win. 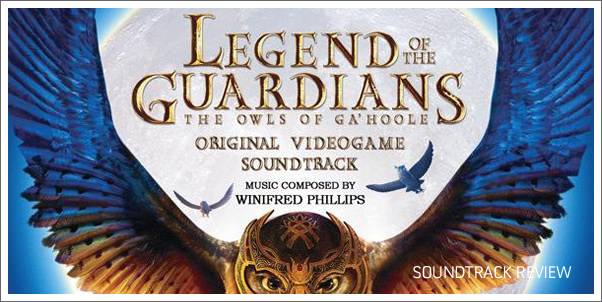 In 2008 and 2009 she was a finalist for Best Original Score in a Video Game, and now she’s just taken home Best Song in a Video Game for one of the tunes in her score for LEGEND OF THE GUARDIANS: THE OWLS OF GA’HOOLE. Based, of course, on the film, the game earned mediocre reviews from critics (as one unfortunately comes to expect from these quick tie-in titles), though the score at least has managed to attract more attention after a generous 53 minute release on iTunes. Following PHILLIPS “Into the Darkness” (1), we learn that the score follows only lightly in the footsteps of David Hirschfelder’s score for the film, tending more toward a percussive, punchier orchestral writing that’s common to the modern media music landscape. No catchy theme is introduced in this first track, but a strong sound palette is established. “With Hearts Sublime” (2) is the award-winning track of the album, and it is certainly a very attractive piece of music with swirling harp arpeggios and soft strings beneath the haunting vocals. It reminds of the music of Enya and some of the songs from the Lord of the Rings, though it tends a bit more toward the generic.